There were times when right-handed reliever Ryan Cook wondered if he would ever be here again, in a major-league clubhouse getting ready for a game. Cook, 30, was called up from Tacoma on Thursday after Christian Bergman, who threw seven shutout innings in a spot start Wednesday, was optioned back to Tacoma. Cook came up huge in his first big-league appearance in three years. He entered the game with runners on second and third and two outs, and struck out Jose Inglesias. Cook then retired the side in order in the seventh. It is no wonder Cook doubted a special night like this would happen again. After signing with the Mariners after the 2015 season, the hits just kept on coming. In his first spring training game with the Mariners in 2016, he tore his lat muscle. While rehabbing that injury, he tore his hamstring. In his first rehab game from that injury, he tore his UCL and underwent Tommy John surgery. When he was supposed to begin throwing after that, calamity struck again. “Scar tissue built up around the nerve and I completely lost feeling in my fingers and lost function of my hand,” said Cook, who played five big-league seasons with Arizona, Oakland and Boston and has a career 13-12 record with a 3.43 earned-run average and 17 saves. 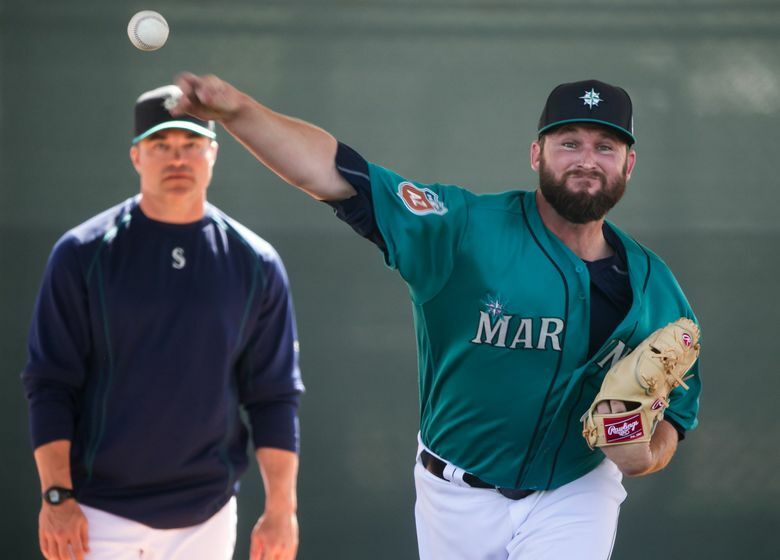 Cook almost made it back to the big leagues out of spring training, but Mariners manager Scott Servais said the decision was made to send Cook to Class AAA Tacoma to make sure he was completely healthy. Cook said he thought he was ready, but he said in retrospect it was the right decision. Now, after allowing only one run in over a month with Tacoma in a span covering 10 outings, Cook said he is ready. “I told the guys when I got here, that was the ]biggest call I ever got,” Cook said of learning he would be joining the Mariners. Servais said Cook will be mostly a one-inning reliever. The manager is expecting good things. * There was talk that designated hitter Nelson Cruz, who suffered a bruised foot Tuesday night when getting hit by a pitch, could return to the lineup Thursday. But Servais said he and the trainers thought it would be best to give him at least one more game off. * Dee Gordon was in the lineup Thursday as the designated hitter, but got a heavy workout at second base before the game. Servais said if all goes well, Gordon might start at second base Friday. Gordon, a former Gold Glove winner at second, moved to center field this season after joining the Mariners, but could see plenty of time back at second base with Robinson Cano suspended for 80 games.